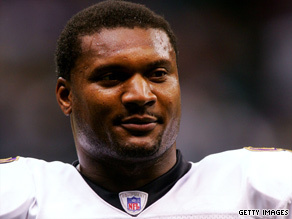 (CNN) -- Former NFL quarterback Steve McNair was shot multiple times, including once in the head, at a Nashville, Tennessee, condominium, authorities said Saturday. McNair's body was found seated on a living room sofa, authorities said. Autopsies were scheduled for Sunday. Asked whether the shooting was a murder-suicide, Don Aaron, spokesman for the Nashville Metropolitan Police Department, said investigators have not classified the incident . He said investigators have not ruled out anything but added that they were not "actively looking at suspects" Saturday night. "I suspect we'll have something to say tomorrow," Aaron said. The bodies were found just two days after Kazemi was pulled over in a Cadillac Escalade, registered to her and McNair, and charged with a DUI, Aaron said. McNair was in the vehicle at the time. Although Aaron described Kazemi as McNair's "friend," a law enforcement source close to the investigation said that the woman is McNair's girlfriend and that the residence is her condominium in downtown Nashville. Witnesses said McNair was a frequent visitor at the condominium. Authorities were questioning people who were near the home, but they said no one was in custody. Investigators don't think McNair's wife, Mechelle, who is "very distraught," was involved, Aaron said. McNair's family issued a statement through a spokesman Saturday, saying, "The families of Steve McNair in Mississippi and Tennessee appreciate the concern, thoughts and prayers during this difficult time of our lost of a husband, father and son. The family requests everyone would allow them time to mourn." McNair's brother, Fred, also confirmed the death but had no immediate details. McNair, 36, spent 13 seasons in the NFL, the majority with the Tennessee Titans, and was named the NFL's co-MVP along with Indianapolis Colts QB Peyton Manning in 2003. He spent his last two seasons with the Baltimore Ravens before announcing his retirement in April 2008. The owner of the Titans, Bud Adams Jr., said in a statement that the organization was "saddened and shocked" to hear of McNair's death. "He was one of the finest players to play for our organization and one of the most beloved players by our fans," Adams said. "He played with unquestioned heart and leadership and led us to places that we had never reached, including our only Super Bowl." The Titans marked a Super Bowl loss to the St. Louis Rams in 2000. Dozens of fans who rushed to the crime scene were rattled by the news of McNair's death. "I'm in shock. It's so hard to believe," Sonya Hughes told CNN affiliate WKRN. "Tennessee Titans, Steve McNair -- on the Fourth of July." Ludy Wallace, former Nashville city councilman, remembered McNair as a "friendly" guy. "I think he made an everlasting impression with people he came in contact with and the people that attended his [football] camps," Wallace told CNN affiliate WTVF. CNN's Mayra Cuevas and Mike Brooks contributed to this report.